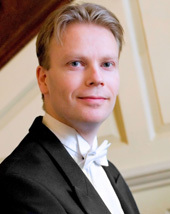 Christopher Langdown has been widely acclaimed as both a soloist and chamber musician. Born in Sutton Coldfield, he had initial lessons with Fay Madeley and Professor Malcolm Wilson before graduating with Distinction from the Royal College of Music in London after completing six years of study with Professor John Barstow. In recognition of his musicianship, Christopher was nominated at the RCM to perform the music of Shostakovich to the legendary exponent Tatiana Nikolaeva and was further distinguished in being twice selected by The Wall Trust as a piano scholar of "outstanding talent". Christopher has acquired numerous awards and was finalist and prize-winner in the 1997 Brant UK Pianoforte Competition which attracted artists from around the world. He has since given recitals at the major London concert halls, including Wigmore Hall, South Bank Centre, LSO St Luke's, Fairfield Halls and St John's Smith Square and appeared at music festivals throughout the UK and Europe. As a concerto soloist he has performed popular concertos such as the Rachmaninov No.2, Gershwin's Rhapsody in Blue and Addinsell's Warsaw Concerto, as well as more unusual works such as J.S Bach's Concerto for 4 Keyboards, BWV 1065. Following his debut recital at Wigmore Hall in 2009, London critics described Christopher's performance as "an adventurous programme by a gifted artist ... some of the finest Beethoven playing I have heard in years" and commended his "undoubted musicality and total pianistic technique". He has also enjoyed acclaim for his collaborations with other renowned artists, including the tenor James Gilchrist and the Fitzwilliam, Martinu and Sorrel / Maggini Quartets. National radio and TV appearances have included live concert broadcasts (solo and chamber), interviews for arts programmes and two radio performances of Christopher's own solo piano compositions. Alongside his concert career, Christopher is Head of Piano at The Kingsley School in Leamington Spa. He has previously been a visiting teacher at the Birmingham Conservatoire Junior Department and Royal Academy of Music in London and been appointed to teach the family members of Pete Townshend, Adrian Edmondson, Jennifer Saunders, Sophie Ellis-Bextor, Gyles Brandreth and Sir Laurence Olivier. In addition to giving masterclasses at home and abroad under the auspices of The British Council, he has had invitations to adjudicate at Music Festivals in Birmingham and Hong Kong.